The once famous Githeriman- Martin Kamotho – is living in squalor in a rented single room within Nairobi’s Kayole area, the Nairobian reports. Worse still, the 43-year-old Githeriman stays alone with his cat after parting ways with the mother of his daughter sometime back. His three by four room in Saba-Saba area of Kayole has worn out sofas, an old wooden table and a cupboard on which he places his radio – which continuously plays gospel music. He says the music helps to cool his nerves and drive away loneliness. The floor of the house has a plastic “carpet”. The wall is decorated with colourful polyester material – with a bed sheet acting as a wall to his bedroom. “This is where I’ve lived for more than a decade. Many people think I’m rich. 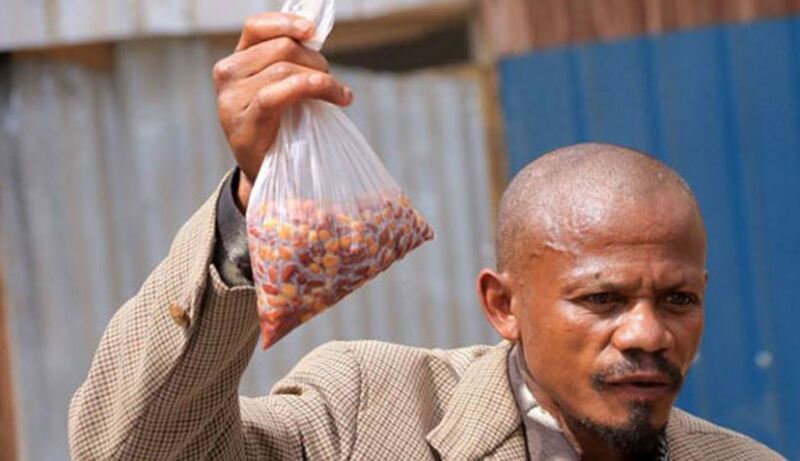 In fact, it makes me sad when they call me Githeri Man, thinking I am a millionaire. I have nothing. The people around here know me – they know ‘sina kitu’. Otherwise ‘wangekuwa wananipiga ngeta kila siku,” he told the tabloid. This is a sharp contrast to what everyone expected following his newfound fame during the August 2017 General Elections. Corporates and wellwishers lined up for a PR opportunity with promises that could change his life for the better. When he was invited to State House towards the end of 2017 to receive his Head of State Commendation (HSC), Kamotho also received Sh100,000 token. During the event, Kamotho was dressed in a navy blue suit courtesy of President Uhuru’s stylist Carol Pulei who offered to dress him every August until 2022. However, this is one of several promises that remain unfulfilled to date. Kamotho says he has been visiting the store located in Kilimani with his uncle, but they have never met the stylist. And so they decided to give up. Another “wellwisher” on the spot is Username Properties who had promised Githeriman a parcel of land in Ngong’. “I’m okay and ready to build a home. They called and asked me to hand over my documents so they can process my title deed. That’s what I’m waiting for,” said Kamotho. According to the Nairobian, githeri man’s Maasai Mara travel package offered by Bonfire Adventures is still but a rumour. Githeriman says he pocketed around Sh150, 000 from his fame but all that has made him poorer since no one offered a lasting solution or advised him afterwards. Kamotho was among graduands who successfully completed a seven-month rehabilitation program at the Mama Care Rehabilitation Centre, Kiambu.